The Pink Lady is a delicious low chill apple tree from West Australia. The fruit has reddish pink color skin, sweet tart flavor, and crisp when ripe. Keeps well and has a unique taste. The flesh is white and does not brown quickly. Grow in the full sun and does well in hot summer climates. Great show of white blossoms in the Spring, and harvest fruit in late October. A beautiful woody deciduous fruit tree, the Pink Lady apple blossoms in Spring. Fruits ripen late in the Summer to early Fall. While in many areas fruit ripe in October, other areas is sooner. Plant in the Full Sun and well draining soil. Use high quality planting mix and fertilizer. The two most important factors relevant to ensuring a deciduous fruit tree’s healthy growth and production are the Chill Requirement and the Cold Hardiness. Chill is measured by 1 hour of temperature below 45 degrees Fahrenheit. Paradise Nursery only grows Low Chill fruit trees that meet the requirements of all areas of the United Stated. The second factor is Cold Hardiness. The minimum temperature a plant can tolerate refers to its Cold Hardiness. 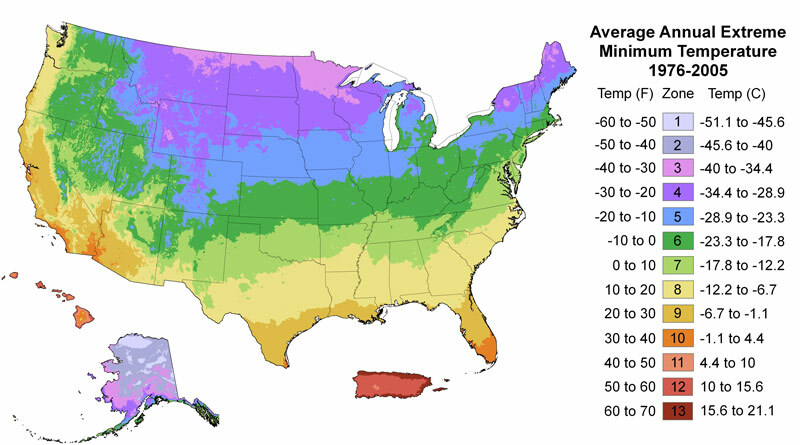 The USDA has developed Cold Hardiness Zones that indicate the average minimum temperatures in the Winter based on weather history. The Chill Requirements and USDA Zone range of each plant is provided. Our website will only allow you to add plants that grow within your USDA Hardiness Zone, and since we only grow low chill edibles, all our fruit tree will bear fruit in your area. Our fruit trees are grown in Standard, Semi-dwarf, and Dwarf forms. Our standard trees grow upright with a central leader and lower later branches. These tree grow taller (15 – 25 ft tall, or more by 10-15 feet wide or more), and create a lot of shade. Our semi-dwarf trees are grown to be kept short ( 8 – 15 ft tall by 8- 10 feet wide. These have a short trunk and will round canopy. Their tips were cut a foot or two above the ground to promote lower branches to grow more and create a shorter tree that is easy to pick, but will provide less shade. Our Dwarf tree are great for containers. Our Dwarf trees have been topped right above the graft to create a bushy tree that is very short (6 – 10 ft tall and wide ) with and very short trunk. These provide much less shade, but are very easy to pic. You walk around this tree, not under it. In home orchards, space trees about 10 – 12 feet apart unless you desire to allow them to grow larger. Provide more space for larger trees. Some trees grow slower and stay smaller, while others grow faster and larger. These are joys of nature. Our Self-fruitful, self-pollinating trees do not require another tree to produce fruit. Trees that require a pollinator are indicated. Only the sweet cherries, and some plum require a pollinator. All our other propagated edible plants do not require a pollinator. All our edible plants are grown by cuttings from mature plants or grafted. This provides plants that are high quality and fruit immediately. Plants will generally begin fruiting within a year of planting. Planting Containerized plants can be installed all year round. It is important to install and plant in a location with the appropriate sun exposure as the plant needs. Edible plants need at least 4 -5 hours of direct sunlight, indirect or filtered sun light is ok, especially in hot climates. It is also important the soil of the planting location will drain water well. Install drains or amend with sand if needed to improve drainage. Dig the hole at least twice as wide, and as deep as the root system of the potted plant. Amend some of the native soil removed from the ground with high quality organic planting mix and fertilizer to use as fill when planting. Place the tree so the top of the root system is level with the ground or slightly higher. Never plant a tree low. Create a watering well or burm around the root zone using the additional soil removed from the ground. This watering well will collect water to allow for deep watering. Fill this until it floods so the soil moisture content reaches field capacity. Bare roots should be potted up or planted immediately. Water them in very well to saturation, then do not water again until they leaf out in the Spring. Bare roots can tolerate the cold. In areas that snow, pot up your tree and wait until summer, after the snow has melted and the plants roots have completely filled the container to plant. Water newly planted fruit trees weekly (1 x / week) during the cooler early spring and fall seasons, and 2 – 3 times per week during the hot summer season. Deciduous plants go dormant in the winter, therefore irrigation water should be stopped. Discontinue watering until the plant leafs out in the early spring. Increase the frequency as the temperature and evapotranspiration rates increase. Once the trees roots grow larger and the plant establishes, irrigation will be needed less frequent. Continue to irrigate evergreen plants such as Citrus, Avocado, Loquat, and Guava trees in the Winter, since they do not go dormant. However, reduce the frequency to no more than once per week, as the weather is cool and likely raining. Fruit trees and edible plants need nutrients to create energy for growth. This is called fertilizer and comes in different forms. Use organic manure, bone meal, blood meal, and humus based fertilizers. Apply fertilizers like manure along with a bone meal, humus based phosphorus fertilizer (1-2-2) NPK ratio in the late winter, right before spring growth. Reapply with organic high nitrogen (2-1-1) or fertilizers with a 1-1-1 NPK as directed by the label during the Spring and Summer growing season. Do not fertilize in the Fall, since temperature drop, plant growth is low. Winter is the time to prune fruit trees and edible plants. Cut to top and other branches on the outer canopy to maintain the trees size and form. Remove any interior growth towards the center of the tree to promote remaining branches to grow outward. Remove any dry twigs and branches. Cut off any new growth below the graft or very low in the tree to direct the plants energy to its main branches. Thin your trees during the Spring and Summer seasons to ensure the plants energy is directed as desired. If the plant provides an overly large quantity of fruits for that branch. Reduce the quantity of fruit so that what remains grows larger. This will also prevent broke limbs. Harvest ripe fruit to prevent undesired pests. Use organic methods to manage pests of edible plants. Horticultural oils such as Neem oil are great winter dormant sprays to prevent and control soft bodied insects. Use organic fungicides such as Borduex and Liqui-cop for fungus such as powdery mildew, leaf-curls, and rust. Use repellants and bird netting to protect your harvest from other animals. Keep a clean environment, free of weeds and dropped fruit that host insects or attract animals.